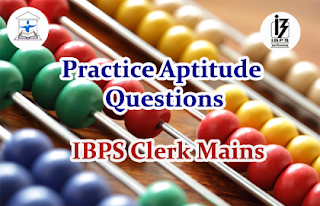 Dear Readers, Important Practice Aptitude Questions for Upcoming IBPS Clerk V Mains Exam was given here with Explanations. Aspirants those who are preparing for the examination can use this. Directions ( Q. 1–10) : What should come in place of the question mark(?) in the following equations? 1).15 : 66 : : 185 : ? 5).3(6 / 7) – 6(1 / 4) + 5(1 / 3) = ? 6).1(3 / 4) + 1(5 / 8) – 2(4 / 5) + (1 / 2) = ? 7).14 × 18.6 ÷ 12 + 19.3 = ? 8).84.2× 642.1× 78.4× 563.5 = 56?